I love coconuts. Love them. Up until I came to India I had no idea what a coconut was. Coconuts came shredded in plastic packages or in tetra packs in the form of coconut milk or occasionally in shrivelled brown flaky unappealing balls sold for a ridiculous amount at Safeway. Here they are huge green globulars that are fresh and sweet and juicy and filling and healthy. Especially in the hot hot sun here they are refreshing and provide natural isotonic electrolytes which make them like the best thing since sliced bread. They are sold everywhere . 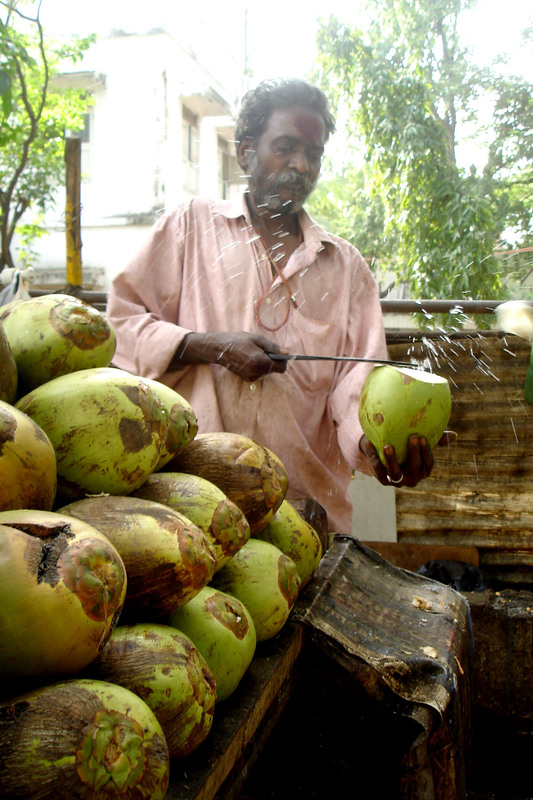 It is common to see men peddling a cart around filled to the brim with green and yellow coconuts. They carry around this small machete and when you buy a coconut, they whack off the top,puncture a hole and insert a straw for you to slurp up the goodness. I usually forgo on the straw (they usually contain all kinds of insect larvae) and drink directly from the hole, letting the clear,sweet coconut water run down my chin. When you are done drinking the water, the man slices off a small oval from the outer shell and cuts the coconut in half to reveal the soft tender flesh. You can scrape the flesh off the sides and eat it and it tastes like heaven on earth. The texture is soft and almost gooey, depending on the maturity of the fruit ranges from almost transparent to striking white. The younger the fruit the more tender the flesh, soft enough to almost swallow whole and with the consistency of something like what I imagine a giants booger to be like. “coconut?” I said pointing to one of the medium sized cocnuts lining the pavement. At this he just looks a little stupefied and clearly resigned to his fate he grabs my preferred coconut, cuts off the top and hands it to me. Two minutes later I hand it back,awaiting the sweet goodness of tender coconut flesh. Without a moment of hesitation he chucks the coconut aside and starts tending to his other customers who have pulled up beside his stall on a moped. I am heartbroken. Like a little kid who has just been told that Christmas has been cancelled I stand there, not knowing what happened and why. The next day I bring Arthi, forever my cultural saviour in times of distress. As we approach the stall she asks me if I like the coconuts with the flesh. Before I can get into just how much I love them we reach the stall. ” Onru Taneel, Onru Elani” she states. Suddenly it dawns. Tannel (water) must mean just the coconut water. It makes sense since the one he gives her looks just like the one I so adamently argued for yesterday. He picks a slightly smaller, yellowish one for me, whacks off the top and hands it to me with a knowing grin and a twinkle in his eye. “Elani” he says clearly, handing me the coconut. I barely register it, my mind is already anticipating the tender coconut flesh, my mouth full of the sweet, succulent, heavenly taste of Chennai. A beautifully written piece with a quiet tenderness for the man on the street of Madras.